When it comes to trees, and the problems they can cause, there is more than meets the eye. The part that you can see – the trunk, limbs, and leaves or needles – is only part of the entire tree. Quite a bit of it exists underground, via an extensive root structure that we rarely even think about. But we should be thinking about those roots, because they’re incredibly strong and resilient, and can sometimes cause major damage. Here are a few things to consider, with regard to tree roots. Proximity to your home. Even if you feel unconcerned about a particular tree’s likelihood of falling on your home, its roots can still cause a problem for you. In some cases tree roots have grown around the foundation of houses, and can cause damage when planted too closely to the main structure. Proximity to sidewalks, driveways, and patios. 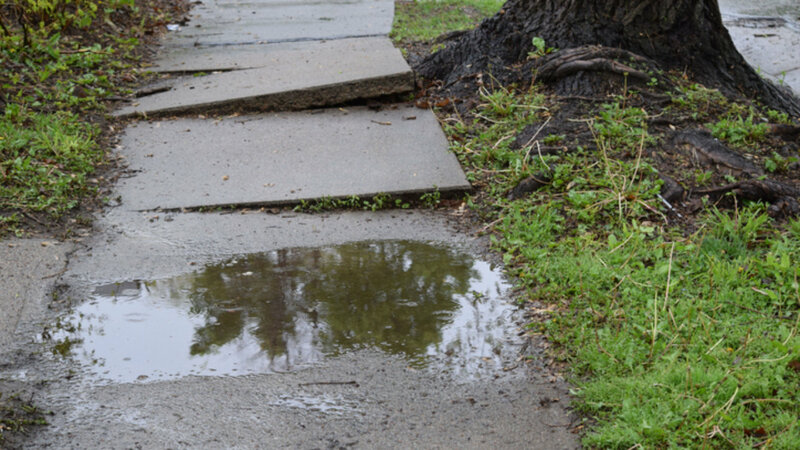 The same type of damage can also occur to other concrete structures, like sidewalks, driveways, patios, and so on. While repairing or replacing these structures is not nearly as time-consuming or expensive as repairing damage to your home’s foundation, it’s still no walk in the park. Avoid planting trees close to hardscape, and keep an eye on larger existing trees. If you’re concerned, we can check it out and evaluate whether a particular tree’s roots are likely to cause a concern. Growth impacting pipes, septic tanks, and sewer lines. Occasionally, tree roots can grow into underground pipes and do major damage to water lines, septic lines, or your sewer system. You might suspect a leak, or even smell something suspicious in your yard. Always contact a plumbing expert immediately if you suspect this type of problem, and of course give us a call regarding the tree. Total collapse can be catastrophic. In the event that a weakened tree eventually falls, you have more to worry about than which direction it lands. Trees often pull up their entire root systems when they finally collapse, meaning a large chunk of your yard can be ripped up. These situations are time-consuming, messy, and expensive to clean up. And of course, patios, driveways, and walkways can be damaged in the process. It’s always better to evaluate a tree’s health and stability, and have it removed before it falls on its own. If you have any questions regarding potential damage from tree roots, or tree trimming in general, please give us a call. We can check out your situation and make a recommendation that protects both your safety and your home and yard.